Jamun, the look-alike of black grapes are also known as Indian Blackberry, Java plum and Jambolan Plum. Jamun is an evergreen beautiful tropical tree, native to India, Pakistan and Indonesia. The botanical name is Syzgium cumini. The tree grows fast and reaches heights of up to 30m and can survive for more than 100 years. Leaves of this tree are smooth, glossy, oblong and placed opposite to one another having a turpentine smell. Its wood is strong and water resistant. Because of this, it is used in railway sleepers and to install motors in wells. The trees start flowering from March to April. The flowers are greenish-white in color, small and fragrant. The fruits are oblong and are ripe in the month of June. It turns from green, to pink to shining crimson black as it ripens. White colored Jamun variety is also produced. There are two types of jamun- the white fleshed jamun has good amounts of pectin and can be used to make jelly, the purple fleshed jamun more commonly found, also makes good jelly but does not have good amounts of Pectin. Another common variety is seedless. The fruit is acidic and astringent in nature, with a sweet taste. Due to its acidic nature, it is usually eaten with a sprinkling of salt. Hindus regard jambul as a ‘fruit of the gods, because Shri Ram (lord Rama) subsisted on the fruit in the forest for 14 years during his exile from Ayodhya. In Hindu mythology several protagonists have been described as having the color of jambul because Lord Krishna has been described as having skin the color of Jamun. In Maharashtra, jamun leaves are used in marriage pandal decorations and the seeds are used in herbal tea for diabetics. In Telugu(native language of Andhra Pradesh,India), this tree is called Neredu. Wood from Neredu tree is used to make bullock cart wheels and other agricultural equipment. Culturally, beautiful eyes are compared to this fruit. In Malayalam(native language of kerala,India) the jambul tree is called njaval and its fruit are njavalpazham. The fruit is particularly plentiful in Kollam. In Kannada(native language of Karnataka,India) the jambul tree is called Nerale mara and its fruit are Nerale Hannu. The Indian blackberry provides lower calories as compared to other fruit; a medium sized jamun gives about 3 to 4 calories. The fruit is rich in carbohydrates and proteins. Glucose and fructose are the principal sugars present in the ripe fruit, with no trace of sucrose. 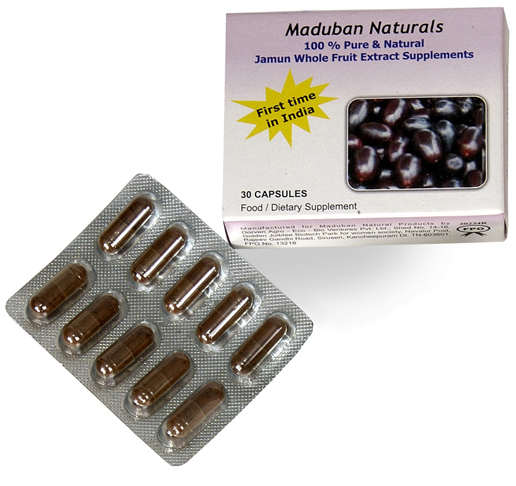 It is a fairly good source of iron as it provides about 1-2 mg per 100 grams. It is an excellent source of vitamin C; this black plum provides 18 milligrams of vitamin C per hundred grams. (The daily adult requirement of this vitamin is 40 mg). Calcium is found in trace amount. 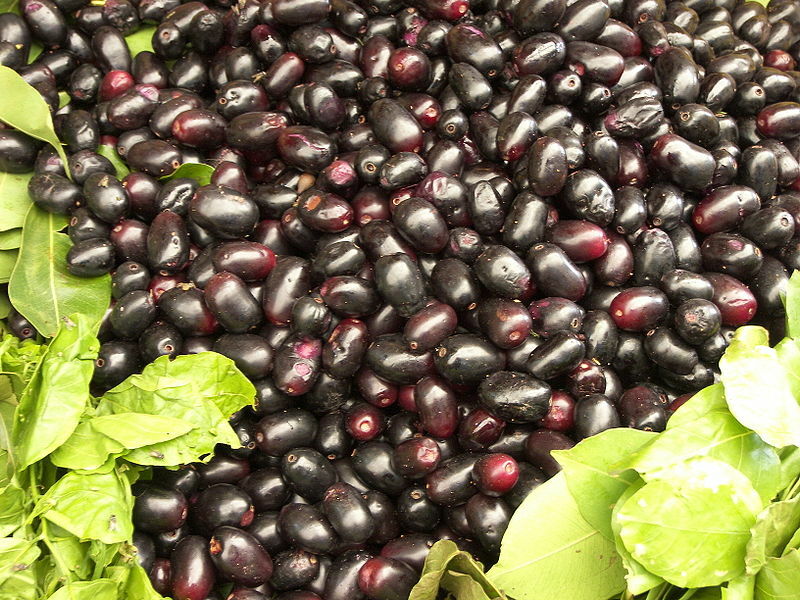 Jamun is a rich source of folate. Vitamin B, magnesium, potassium, fiber, carotene and phytochemicals (anti-oxidants) are also available in large amount. The stem & bark contains tannin, gallic acid, resin, phytosterols. Research confirms that polyphenolic compounds have far-reaching health benefits including prevention of several chronic diseases like cancer, heart ailments, diabetes, ageing and arthritis. The seed contains the glycoside, jamboline, gallic acid and essential oils. The leaves contain essential oils. The fruit is used as an effective medicine for diabetes. Not only fruits but extract of the leaves, the seeds and the bark of the jamun plant have been found to cause a noticeable decrease in blood sugar and glycouria or sugar in the urine. Several studies prove that the jamun are rich in alkaloids which have hypoglycaemic effects it can bring upto 30 percent reduction in blood sugar. Jamun play an important role in prevention of liver damage (necrosis and fibrosis). It plays a protective role in liver disease. Studies show that jamun fruit extract has anti-cancer properties because of the presence of several bioactive phytochemicals including polyphenols which include anthocyanin (the purple pigment). Some studies also show that consumption of jamun may also provide benefits during chemotherapy and radiation. The jamun has blood purifying properties. The leaves of the jamun tree have anti bacterial properties and are used for making medicines that help strengthen teeth and gums and bark are used for gingivitis. The bark and leaves are used to control high blood pressure. The bark of this tree is useful in de-worming; treating urinary disorders, and is used to formulate many herbal medicines. This fruit is important in ayurvedic, unani and chinese medicine for alleviates kapha, pitta and indigestion. Jamun juice acts as a dieretic and gives a soothing effect on human digestive system. (People in the countryside use 10 to 20 ml juice of jamun leaves to control nausea and vomiting caused by indigestion and gastritis. It is used in diarrhea, dysentery and dyspepsia and also in conditions where the patient passes blood-mixed stool. It is used for ringworm treatment, water diluted juice is used as lotion. A decoction of bark is used in cases of asthma and bronchitis and are gargled or used as mouthwash for the astringent effect on mouth ulcerations. Its bark is used in ulcerative colitis spongy gums, and stomatitis because of astringent properties. Jamun has properties which prevent excessive urination or sweating. It is also a thirst-retardant and blood-purifier. Its astringent property is really good for oily skin. The mask has a great help in cleaning pores of skin and for acne too. (squash some jamun in a container and add a little of lemon juice and apply a thick layer on your face). For dry to normal skin, add honey in the mask and apply on the face. Other uses: The fruits of jamun are used to prepare vinegar which is very good carminative. The ripe berry is also used to make wine. 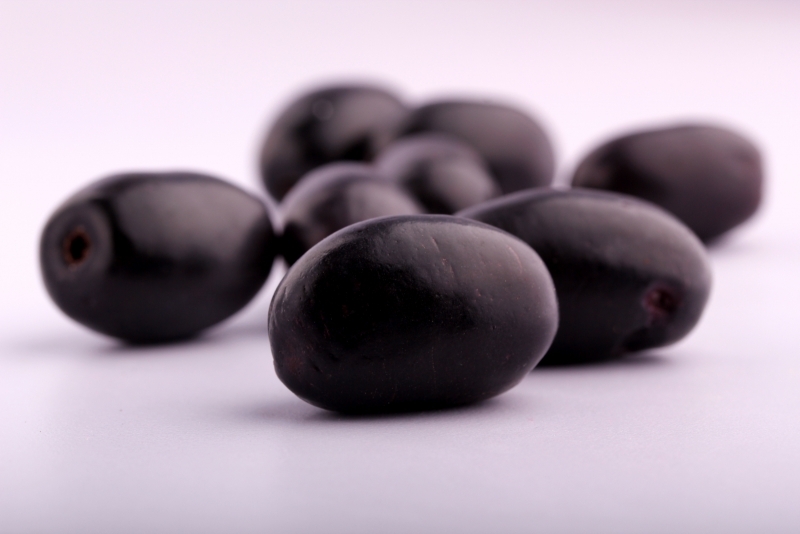 Overeating of ripe jamun can cause hyperacidity and retention of gas in the abdomen. (To counter these conditions half teaspoonful of the roasted jeera powder and a pinch of black salt should be taken with warm water). Buying jamun from roadsides may be risky as the fruit may be contaminated by lead and heavy metals from exhaust fumes. In case of those having swelling on the body, women who have just delivered and those who suffer constant vomiting do not consume it. Always sprinkle rock salt before consuming jamun. If you feel uneasy after eating jamun, drink buttermilk to which some salt has been added or eat dried ginger or amla. Thus we can say that not just the fruit but the entire tree is beneficial to our health. Pick the largest size of the fruit. They are best in quality and sweetest.